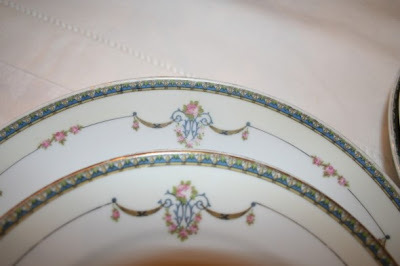 I found some more Noritake China at the Goodwill a couple weeks ago. It's not the same pattern that I found before but they are all mixing and matching together quite well. There were only 3 dinner plates, 99 cents each, 3 salad plates, 79 cents each and 3 bowls, 99 cents each. Below you can see my different patterns together. The bluebird plates aren't Noritake but I think they all go well together. I also found this tureen for only $5.99. It only says Austria on the bottom so I don't know much about it. It's missing the ladle so I'm going to look for a pretty silver ladle to use with it. I hope everyone is having a great Labor Day weekend! I wish every weekend was a 3-day weekend...this is nice being home on a Monday! I'm going to work on a small project today so hopefully I'll have some pictures of it to share later in the week. Those pieces are beautiful. And I can only imagine what your little project entails. One thing I know for sure - it'll be beautiful and I could never do it! Your china is pretty, and great prices, they do go together nicely. I love to mix and match like that!Love the tureen..beautiful! Enjoy your Monday at home, and your project,~ can't wait to see what you have in store for us this time! Love the china...and you can't beat the prices. Good job! I've been thinking about the paper roses you did a while back. When I was home last Tuesday, Martha had a rerun featuring the rose lady. I have my coffee filters and watercolors...just need to get the wire and paper for leaves. I like the different patterns better than if they were all the same, Cindy. I love having friends over for dinner and I can mix and match my vintage tableware. The tureen is lovely. What great finds! Our Goodwill has such erratic pricing - yours must do a good job. Enjoy your goodies. Enjoy your Monday at home! All those china pieces do mix well together and I love that soup tureen! Happy Labor Day! I love your bluebird plates - they are so sweet and they do go perfectly with your new finds. I'm typing this from the Denver airport! Trying to kill some time between flights. Gosh I love wireless. whoops - that was me above. My mouse got away from me. I'm always on the look out for china at my thrift store, but never see anything as nice as what you have found. I love the mix 'n match look. It's much more interesting. ITA about the three day weekend. 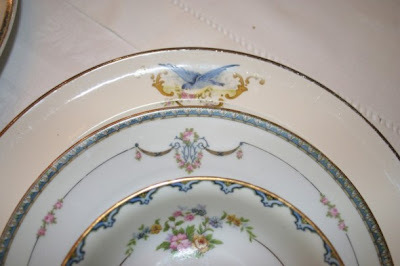 Such pretty dishes, and I especially like the bluebirds! 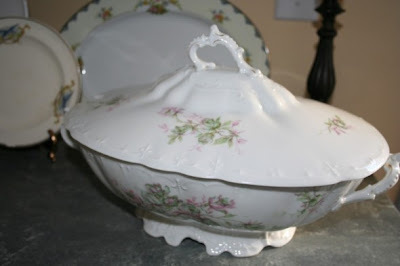 I love that tureen! I've always wanted one...I don't know why I've never picked one up. Yours is beautiful and for my kind of price!! I think they look lovely together. I went to Goodwill on Saturday and had no luck whatsoever. I will keep trying, though! Lovely china finds Cindy - mix and match always works better than having everything the same! I collect white/cream tureens - but have never found one at such a bargain price - lucky you. Glad you had an extra day off - hope you share your project as I know it will be something wonderful! I just found your blog ~ I love it ! You found some amazing things ~ ours never has such pretties !!! I made my first trip to Goodwill Saturday - inspired by you to do so. No good finds that day, but I will try again. Your mixed patterns look just fine together! BTW, you got me hooked on the sparkling lemonade drinks - that has saved me this summer - saved me from having a parched throat! I love your china. It is so fun to mix the patterns. I love that. Can't wait to see what your project is. Hope you had a great Monday off. The china is beautiful together. I'm new to this blogging thing, but i have to say yours is my favorite. Your home is inspiring! Cindy - would you mind to look at the name of the bluebird china and post it? I just love it. Great finds. 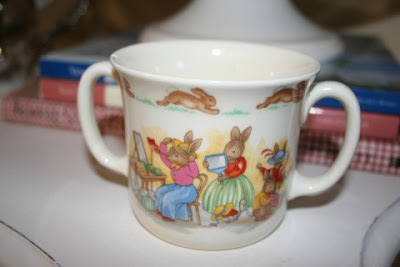 Each of my kids received a Bunnykins set when they were born and I love the stuff. So cute! I just love that little box and what a great idea! I'll have to remember to be more open minded when I see something that would work with a little tweaking!